Stephen Massett : Lahaina, 1863. 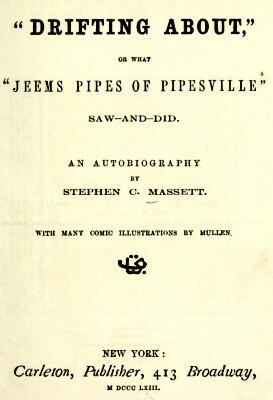 "Drifting about"; or, What "Jeems Pipes, of Pipesville," saw-and-did. Carleton, 413 Broadway New York, 1863, pages 149-150. The bathing, and diversions with the surf-board by the natives, are particularly amusing. In the south part of the town, I used to wander when the sea was rolling in heavily over the reef, and observe the evolutions and wondrous rapidity of a set of surf-playing natives. The sport is immensely attractive, and to the Hawaiians full of the wildest excitement- though certainly I fancied to a novice it would be dangerous in the extreme. As I witnessed this exciting and exhilarating amusement, how greatly I regretted my inability to swim, or to get balanced on a board just before a great big wave - and to be hurried in half a mile or so landward with racehorse speed- all the time wrapt in spray and foam - and without letting the roller break, and tumble over my head. It seemed to me to require great strength of muscle to keep the head and shoulders just ahead and clear of the great crested wall that seemed impending over them - and threatening to bury the bold surf-rider in its watery ruin. ... skill, and daring - riding upon the neck and mane, as if it were one of their furious chargers; and when you look to see them in their swift course dashed upon the sand or rocks, they will just slip under the belly of the wave they have ridden - and are away outside again, waiting for a sail upon another. On the Atlantic sea-board there is wanting the delicious temperature of the water within these tropics, and I can conceive of nothing more exquisite than laving the wearied limbs in its invigorating embraces. or, What "Jeems Pipes, of Pipesville," saw-and-did. Carleton, 413 Broadway New York, 1863. Geoff Cater (2011-2012) : Stephen Massett : Lahaina, 1863.